While the beginning of Spring is certainly an exciting time for those of us who live in colder climates as we shed our winter gear and start spending more time outdoors, it also marks the beginning of allergy season, which can be pretty miserable, especially for children. From sneezing and a runny nose, to watery eyes and an itchy throat, seasonal allergies like hay fever can cause a lot of discomfort to those who are allergic to tree, grass, and ragweed pollens, and today we’re sharing our favorite tips and remedies that offer natural allergy relief for kids. What are the symptoms of seasonal allergies in kids? 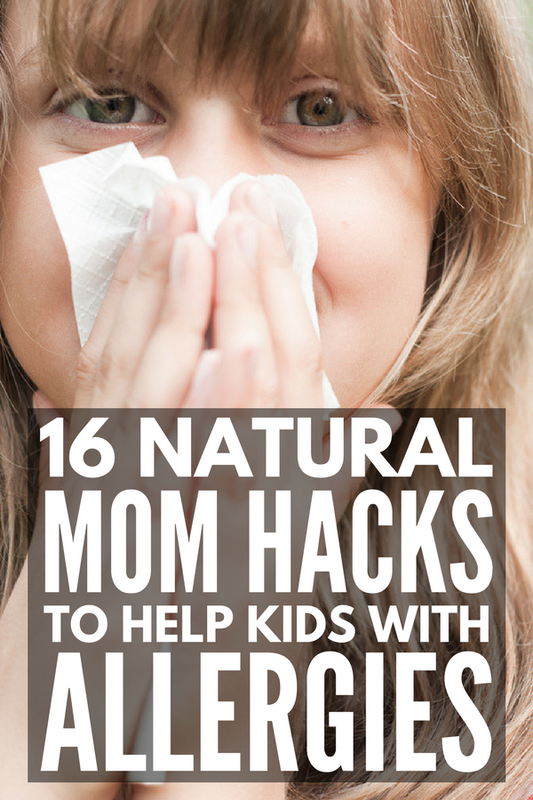 Before we get into specific natural remedies for children’s allergies, there are a lot of helpful natural allergy relief tips I’ve discovered over the last few years that have helped keep my family happy during hay fever season, and I highly recommend them. INVEST IN CENTRAL AIR CONDITIONING. One of the first things our naturopath told me when we were discussing home remedies for allergies a couple of years ago was to keep all of the windows in our home closed. Period. Fortunately, our house already came equipped with central air conditioning when we bought it, so this was pretty easy advice for us to follow. I know this isn’t as simple for others who either don’t have central air or who live on a very strict budget. A small window air conditioner in your child’s bedroom might be the perfect solution to make nighttime more bearable. PLAN AHEAD. Keeping kids inside during the summer months is next to impossible. Trust me. I know! But since pollen counts tend to be the worst on warm and/or windy mornings, and are less likely to cause issues on cool and/or rainy days, you can be strategic with your time by checking your local weather forecast and planning ahead. WASH EVERYTHING. Now that I know my daughter has a grass pollen allergy, I make sure to change her clothes after extended periods of time outdoors, force everyone to bathe and wash their hair at night, and change all of our sheets at least once a week to minimize the amount of allergens in our bedrooms and make sleeping easier. It really makes a difference. DRESS APPROPRIATELY. While it may seem silly to dress a child in long-sleeved tops and pants during the summer months, it can help limit exposure to allergens while playing outdoors. Opt for light, cotton clothing that can breathe in the summer heat. GET AN ALLERGY TEST. If your child really struggles with seasonal allergies, consider connecting with an allergist for a complete allergy test. You may be amazed to find your child is allergic to things she consumes and/or comes into contact with daily that you didn’t even know aggravated her, and cutting those allergens out of her life could be life-changing! MAKE DIETARY CHANGES. An allergist or naturopath may be able to give you some pointers on foods to avoid based on your child’s specific allergies. This usually involves going on a strict elimination diet, and can be pretty restrictive at first, but as you start introducing foods back into your child’s diet, you will soon see which ones cause a reaction and can cut them out for good. While babies can certainly develop a number of different allergies from birth onwards, seasonal allergies – or, more specifically, allergies to inhaled substances – don’t typically appear in children until they start school. And since the symptoms of allergies are very similar to the symptoms of a common cold, it’s important to confirm exactly what is ailing your little one before you consider natural allergy relief for babies. A good rule of thumb is to consider the length of time your child has been experiencing symptoms. If her sneezing, coughing, watery eyes, and runny nose last more than a couple of weeks, make an appointment with her doctor to rule out other medical conditions, and if seasonal allergies are suspected, discuss some of the following safe baby allergy treatment options. SALINE SPRAY. Nasal washing 2-3 times a day with a saline spray helps flush allergens out of the nose while also relieving congestion and irritation. Arm and Hammer’s Simply Saline Nasal Mist is a great product to consider if you’re looking for allergy relief for babies. HUMIDIFIER. Humidifiers are another safe baby allergy treatment option as they help reduce inflammation of the nasal passages, allowing you to expel allergens from your baby’s nasal cavity via a nasal aspirator, thus reducing allergy symptoms. Be sure to choose a cool mist humidifier, as warm mist humidifiers and vaporizers are not safe for use in a baby’s room, and be careful not to close the door to your child’s room when the humidifier is in use to ensure it does not become too humid. PROBIOTICS. Research suggests that 70% to 80% of our immune system is located in our gut, and that improving our gut flora through the consumption of probiotics can simultaneously improve our immune health and help us ward of seasonal allergies. Of course, probiotic supplements were only recommended to children 12 months and older for a long time, but with recent research confirming the safety of probiotic use in infants, there are now probiotics available for babies as young as one-day-old. If you’re interested in using probiotics as a natural baby allergy treatment option, speak to a licensed naturopath to confirm which brand and potency will work best for your child. DIETARY CHANGES. If you are still breastfeeding your baby, talk to an allergist or naturopath about your own diet to see if the things you are ingesting could be caused your child’s allergies, and if your baby is on a diet of formula, cow’s milk, and/or solid foods, keep a food journal for 3+ days and discuss whether any of the foods she’s consuming could be causing her discomfort. Does your child suffer from eczema? While there aren’t as many home remedies for allergies that are safe for babies, the internet is full of natural allergy relief for kids that don’t require the use of OTC medications. It may take a bit of trial and error to find something that works well for you and your family, but with a bit of patience and persistence, (natural) allergy relief IS possible. SALINE SPRAY. We already touched on this above, but in case you skipped ahead, it bears repeating. Nasal washing 2-3 times a day with a saline spray helps flush allergens out of the nose while also relieving congestion and irritation. Boogie Mist Sterile Saline Nasal Spray is a great option for young kids as it has a scented applicator (currently available in grape and fresh scents) and since it contains the same amount of saline that is naturally found in the body, it can be used as often as needed. EYE DROPS. If your child experiences red, watery, itchy eyes as a result of seasonal allergies, talk to her optometrist about artificial tears and/or an eye wash to clear allergens from her eyes and offer relief. RAW LOCAL HONEY. It has been said that consuming small amounts of raw, local honey each day can help with seasonal allergies. By directly exposing our bodies to local pollen, it is thought that we will become less sensitive to that particular pollen over time. Honey also offers a quick and delicious sore throat remedy – mix with warm water or your favorite tea, or lick it straight off a spoon for instant relief – but avoid giving honey to kids under the age of 12 months due to the risk of botulism, and discuss the use of local honey with your child’s doctor to ensure it is safe and will not make her allergy symptoms worse. HOMEOPATHY. For those who aren’t in the know, homeopathy is a safe and natural way of healing without any of the side effects of traditional medications. Homeopathic treatment is individualized, and involves ingesting very small doses of substances that are said to produce the same – or similar – symptoms of illness in healthy people if they were administered in larger doses. If you’re looking for affordable natural allergy relief for kids, consider booking an appointment with your local homeopath for more information. PROBIOTICS. As previously mentioned, 70% to 80% of our immune system is located in our gut, and research strongly suggests that the consumption of probiotics can improve our gut flora, which in turn improves our immune health and helps us ward of seasonal allergy symptoms. Make sure to consult with a licensed naturopath when selecting a probiotic for your child to confirm which brand and potency will work best. NATURAL ANTIHISTAMINES. If your child suffers from itchiness due to allergies, there are certain natural antihistamines that can offer relief without the negative side effects of OTC medications. We’ve had a lot of luck with Sabalia by Boiron. They are non-drowsy, quick-dissolving tablets that offer fast relief of sneezing, runny nose, watery eyes, and itchy eyes and throat. I keep a box in my purse at all times in the summer months! Seasonal allergies can make life pretty miserable, especially for young children who want to spend as much time outdoors as possible during the warm weather months, but with a little planning and preparation, these tips will teach you how to provide natural allergy relief for kids without the negative side effects of OTC medications. If you found this post about natural allergy relief for kids helpful, please share this post on Pinterest! And if you’re looking for more parenting tips and tricks, please follow our Parenting board, where we share all kinds of great ideas we find each day!